When travelling down on holiday to Cornwall many of my friends ask me "What are those white hills we can see near St Austell?" My reply often shocks them when I explain that that those 'hills' are in fact the massive deposits of waste from the China clay industry. Because China clay or kaolin is white the quarried areas look like they are permanently covered in snow. Clay miners extract clay from granite using high pressure water to turn it into slurry. From there they pump it to processing centres where it they refine it into a bewildering array of everyday products. When you brushed your teeth this morning, the toothpaste you used contained China clay. When you used the bathroom toilet, the toilet bowl contained China clay! With such a large operational area and the use of lots of water, there is an ongoing risk of clay slurry and sediment running into local rivers. 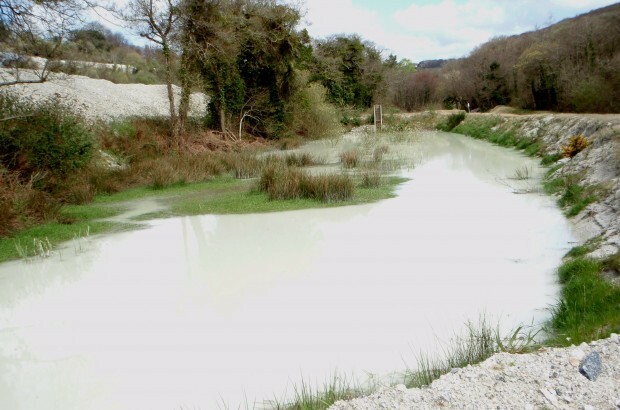 Historically, locals called the St Austell River the 'White River' due to the constant discolouration with clay particles. 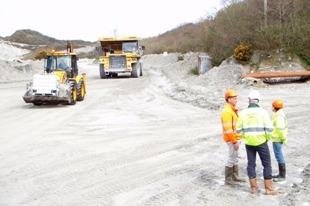 Today China clay operators manage with much more awareness of the potential for environmental impacts. Few people realise how big an area the China clay industry covers in Cornwall or the volumes of minerals it produces. For every tonne of clay quarried, the miners create nine tonnes of waste rock and mica. The clay operations cover 35 square miles. The clay company Imerys has created some of the biggest holes in the ground in Europe. These are huge terraced voids, so deep in places that massive rock lorries, capable of hauling 50 tonnes at a time look like tiny toys at the bottom of the pit. We have worked closely with Imerys over many years to help them with proactive pollution prevention. This has seen less and less pollution of rivers with clay sediment. As well as pollution prevention we also regulate the amount of water that the company takes from local rivers to ensure that they are not run dry. Where possible we like to see treated water returned to the same river as it came from. As a result even the 'White Alps' of mid Cornwall are changing to a more natural green hue. Working with Imerys we supported the restoration of old clay waste tips. They used suitable composted waste and soil to create artificial soil for spreading on otherwise barren waste slopes. Along with reshaping of these waste tips, this greening process has turned them into Cornish heath land with some great wildlife value. There is still a lot to do working with the clay company Imerys. In 20 years time I am looking forward to my friends coming on holiday and commenting on the beautiful heath lands of mid Cornwall and not the White Alps. I see the photo above is a picture of melbur pit and that is in fact a spill way used as a catch pit to prevent clay slurry from getting to important environmental areas so showing that picture in the context of polluting the environment is much so out of context as it has clearly served its purpose, also the 9 tons of waste is not entirely accurate as a large proportion of sand and mica is used by outside company such as brook land sand and aggregates to create building sand and such meaning waste is reduced you may need to update your figures. Thanks for the comments John. The terminal catch pits as you know are designed to intercept sediment laden run off from operational areas. These also have a final discharge point to local rivers like the River Fal. The catch pits only work well so long as they are de-silted regularly otherwise the retained sediment is put back into suspension during periods of heavy rainfall and can be discharged into the river causing a sediment pollution. Our work with Imerys is looking at ways to make catch pit retention more effective by reducing sediment laden input via source control to reduce undesirable discharges which do still occur. The figures for the volume of extractive mining waste generated were provided by Imerys. We are aware of the moves to use some of this for secondary aggregate production which is very welcome as is the creative and permitted use of controlled waste as part of clay tip restoration.